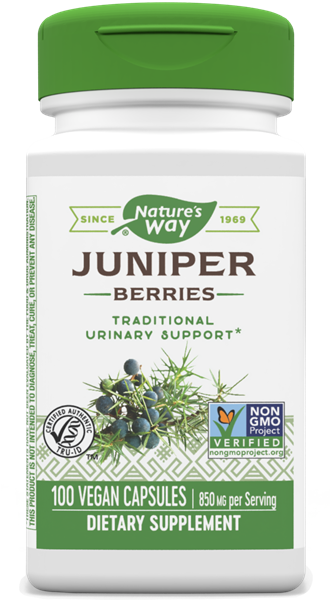 Juniper Berries / 100 Caps - Nature's Way®. Juniper is a traditional herbal remedy. Take 2 capsules three times daily. Increase the amount of fluids taken throughout the day. This product should not be taken for more than 4 weeks. Consult a healthcare professional for recommendation on prolonged or repeated use. Caution: Do not use if pregnant, nursing or if you have a kidney condition. If taking any medications, consult a healthcare professional before use.